The Incipio Smart Feather for the iPad 2 is meant to be a perfect, ultra-light companion for the iPad 2 using an Apple Smart Cover. I realized some time ago that being compatible with the smart cover is now a must-have feature for me when looking for iPad 2 cases, as I’ve found that I’m a huge fan of the smart cover. 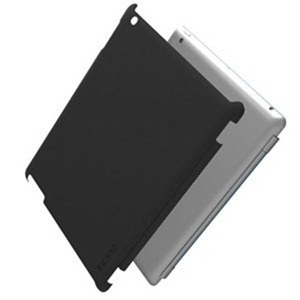 The Smart feather® is custom-molded to fit the contours of the iPad 2, ensuring a snug and sturdy hold. With great attention to detail, Incipio® designed strategically-placed custom cutouts in the Smart feather®, allowing the Apple Smart Cover magnets to adhere to the iPad 2 near each of the two side corners. Sounds great if you’re a fan of using the iPad 2 smart cover right? Unfortunately it hasn’t lived up to my high hopes for it, not by a longhsot. In fact, this case has very quickly become unusable for me. The reason for that is that it does not work at all well with the iPad 2 smart cover. It basically ruins the smart cover while it’s on the iPad 2. It ruins it because the smart cover falls off often and continually while the Smart Feather is on – something that * never * occurs in normal usage of the smart cover. It also makes it much harder for the smart cover to attach itself to the iPad 2, and more often than not when it does attach, it attaches wrong. It attaches itself to the left edge of the iPad 2 bezel, rather than to the left side of the iPad 2 as it should do – as you may be able to see in the photos below. The first one is the iPad 2 with the Smart Feather on, and the smart cover is ‘stood up’ on the bezel rather than attaching properly to the side. 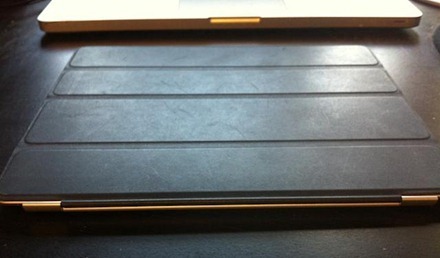 The second one is the iPad 2 and the smart cover attached properly. This case does feel fairly lightweight, though not as ultra-light as I expected. It looks relatively smart (it comes in a range of colors, I chose black) though it does pick up fingerprints and smudges incredibly easily. Honestly, none of its other attributes matter for me. It was purchased solely as a good prospective companion for the iPad 2 and smart cover – and it doesn’t play nicely with the smart cover. I’m not in the market for a stand-alone back cover case for the iPad 2, the only purpose of this case was to work with the smart cover and it fails to do that, so it’s a goner. I’ll continue looking for an ideal case to use with the iPad 2 smart cover – but I’m beginning to feel that my current combo of smart cover plus screen protectors for front and back may be my best bet. Have any of you tried this case out with the iPad 2? If so, how did it go for you? After several purchass (and returns), I settled for Speck’s SmartShell for a simple thing: it has a magnet which keeps the SmartCover attached when folding back, which is a great convenience. That one does look good. I may well give that a try. Once properly installed, the smart cover is NOT coming off unless you take off the smart feather case first. I can now literally pick up the iPad by only the smart cover – something that isn’t possible without the case. **At first, I was a little disappointed with this design because before, I would completely remove the smart cover when using the iPad. But after using this new case for a couple days, I absolutely love the design. My favorite part? It doesn’t add any noticeable bulk to the iPad’s sleek design. I have Incipio feather cases on my iPhone and iPod Touch and even those add SOME bulk. The smart feather case is awesome. From the first time you see the Cover, you know how it is used. The Website from Incipio even clearly states how it works and shows pictures. The package of the Case states the same. It’s amazing that you even made a review about that. What’s next? A test about a screen protector which you are going to attach to the back of the device and then complain in you review that it didn’t protect the screen?! So all in all your review is useless and i wonder how you even managed to put the cover on the ipad, seeing that you don’t even know what you had in your hands….. I agree with Raziel . The reviewer obviuosly had no idea how to put it on . No offense, but it sounds like you’re using the case wrong. If you use it as intended its impossible for the smartcover to fall off. The Incipio Smart Feather is, in my opinion, the best back cover available by for the sole reason that it holds the smartcover in place. 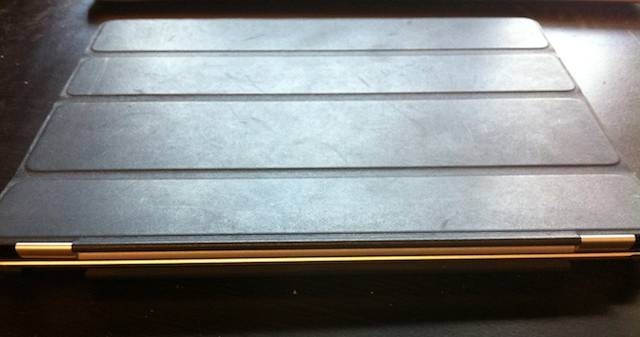 I’ve found the magnet on the smartcover sorely lacking and constantly have to re-attach it. With the SmartFeather – problem solved. No offense, but you’re the first person I’ve ever heard have any issues at all with the smart cover magnets. They work perfectly for me.